Tai Chi For All Ages! You don't have to be a kid or teenager to be interested in learning tai chi! 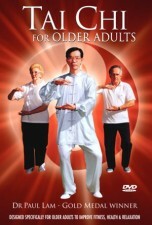 At Tai Chi Productions, we have tai chi instructional DVDs for people of all ages. Get more than just DVDs, as we have tai chi books and Chinese tai chi music. Fulfill all of your tai chi needs with Tai Chi Productions!